DARTMOUTH, MA—After federal authorities arrested two students from the University of Massachusetts Dartmouth on Tuesday in connection with the Boston Marathon bombings, officials at the university told reporters they are starting to seriously regret offering a semester-long course in Applied Domestic Terrorism. 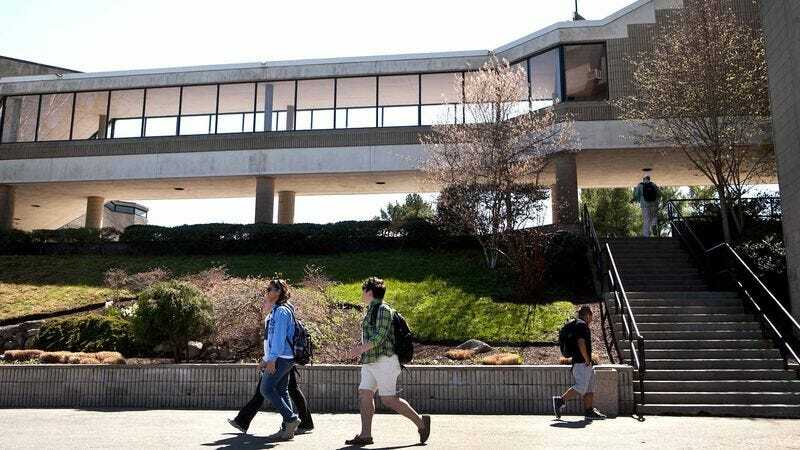 “ADT 201 has long been one of the most popular courses in our registry, and we have always tried to offer a progressive and wide-ranging list of classes to our undergraduate students, but we recognize, at this juncture, that this particular plan of study may not have been well-considered,” university spokesman Greg Stelter said of the popular tutorial-style course, which reportedly uses a “problem-solving approach” to equip students with the knowledge of homegrown terrorism techniques and the skills for carrying out large-scale domestic attacks on innocent civilians in major metropolitan areas. “It’s a shame, because this is one of the only programs out there that offers students a well-rounded survey in domestic attack planning and execution, from bomb-making to fertilizer explosions to online threats and computer viruses. Plus, it’s a required course for Domestic Terrorism majors.” At press time, Stelter had announced that until the board of trustees had reached a decision on the course, currently enrolled students should continue attending classes and taking practical exams.